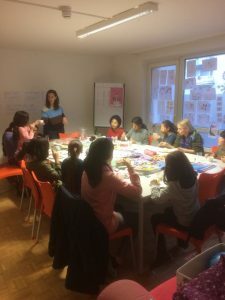 We just completed the first term of our English Tutoring & Homework Support classes for the refugee children in Hanau, Germany. In the past weeks we had special lessons and special crafts activities. We also discovered that the children love to hear stories! 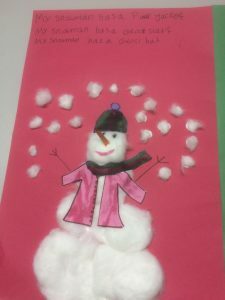 The one about “Sneezy, the Snowman” was a great success! 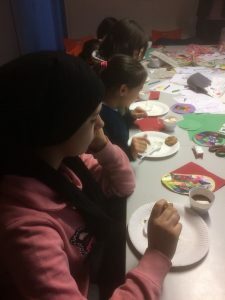 Today we had a Christmas Party with games, hot chocolate, cookies and a cake that one of the parents generously decided to bring for the children and volunteers. What a great way to close the year! 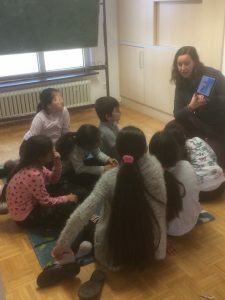 We want to say a big thanks to Laura Rensberger for the brilliant way in which she led this project, teaching the kids and coordinating the helpers with such love and dedication. A big thanks also to all of you, donors and volunteers, who contributed to make this possible. We are counting on all the support we can get to continue the work next year!